As HMV continue to report heavy losses this week, it’s clear that the music giant’s desperate attempts to entice consumers once again into the world of physical music have failed. Despite enjoying a brief respite a few years ago as indie kids discovered the world of vinyl, the unfettered convenience that digital music services such as Spotify offers has made it difficult for people to justify trudging down to their local music shop to pick up a CD. However, a student from Sweden named Jordi Parra has decided to reignite our interest in the physical form with his Spotify Radio. 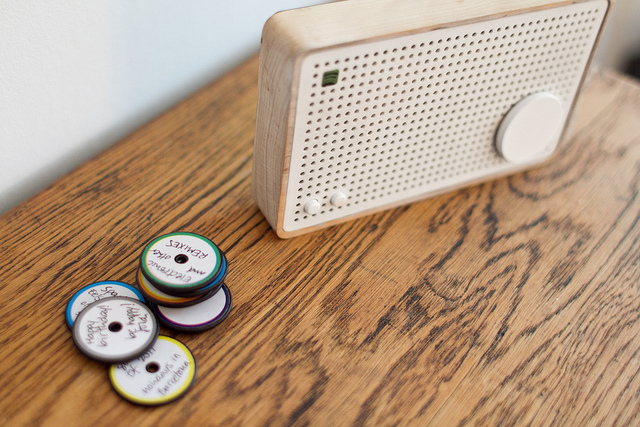 The project was developed as part of his degree project and uses RFID technology to identify a set track list assigned to small wooden discs. Once you’ve synched a disc with your computer, simply place it on the radio to hear a custom-made playlist. You can also write on the discs, just as you would after creating an old cassette mixtape from back in the days when people thought THEY were killing music. If only they knew what was around the corner. Check out the video below to see the prototype in action. This entry was posted in Design, Gadgets, Innovation, Music. Bookmark the permalink.